What's Your Favorite Single Malt Scotch | What's Best Audio and Video Forum. The Best High End Audio Forum on the planet! Lagavulin is probably one of the most eminently drinkable and excellent whiskys. And despite its incredible escalation in price the last few years...it is still very very good value for money, and i think it ranks up there with some of the all time best whiskys ever. For me, Macallan 30 year, Yoichi 20-yr, Springbank 21, Springbank 18 are amongst my 'top 5' but i would easily say Lagavulin is in the top 10...and number 1 for value for money. Next, believe it or not is probably Springbank 21 which is mindboggingly good...especially if you like Lagavulin 16. (BTW, i also have the 12 and Distiller's Edition). I have not had the Balvenie...which one is your favorite and how do you compare it to the Lagavulin 16...which i just finished last nite!!! The Balvenie is like a light Lagavulin 16. The 16 is far superior and much more intense but the Balvenie is hitting the spot right now. I think I'll pick up a Springbank 21 this weekend. Haven't had it in years. let me know if you like the springbank 21....they've skyrocketed btw...though you probably know that. good to know on balvenie...will give it a try next change i get. I am very happy with the Macallan 18y/o. The problem with Scotches, however is the same as wine. Some vintages are better than others. Agree on macallan 18...generally find it comparable/better than 25-yr and far superior in terms of value. Every try Macallan 30-yr? or St. Magdalene 26-yr? Stunning and quite a bit better (to me) than even the mighty 18 which ranks within top 15 for me. For a simiar flavor without the bite of peat, this single malt Irish whiskey is very smooth. I ventured to buy a bottle of the Bushmills 16yo Three Woods about a month ago. Prior to that I had loved Dalwhinnie 15yo Scotch. The Bushmills has charmed my palate. What a complex mix of flavours it possesses. I didn't buy it based upon your recommendation, but I'd sure like to confirm that it is a worthy spirit. Thought I would revive this thread as I have been sampling a few new ones lately. Longmorn 16 Best with a splash of water to open it up. Both smooth and flavorful at the same time. Tobermory 15 Complex and spicy, there's a lot going on in each sip. Just received a bottle of Bruichladdich The Classic Laddie. It's unpeated so I know I will enjoy it, the question is how much? We recently ordered the Balvenie 21 Year Old PortWood, and have to say was very enjoyable. I can see why this is a love/hate bottle because it is incredibly smooth and light and IMO designed to be had neat without water; many may prefer a whiskey to have more bite/"character" but for me it is really nice to find an incredibly smooth and subtle-graceful whiskey. 1980 Bowmore Single Malt, cask strength; though my normal favourite tipple is currently an Irish 15 year old Red Breast pot still whiskey. The 1980 Bowmore is definitely in the top three whiskies I have ever enjoyed - sublime. Might I be so bold as to suggest you try the 15 year old Red Breast - its a pot still whiskey, distilled in the south of Ireland. While a touch sweet, its exceptionally smooth and leaves a delicious after taste on the pallet. Triple distilled. Quite a different experience to what I Scottish cousins offer, like most Irish whiskeys, there is no peat / smokey finish. If you can't find the 15, then the 12 is a wonderful compromise. I don't think the 12 cask strength is worth the premium. Better off spending another $10 and getting the 15. 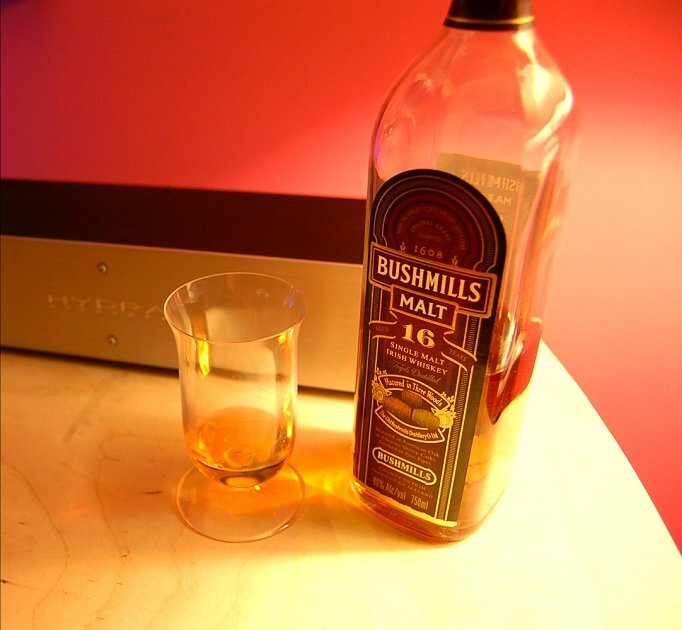 Have not had one for over a decade, but in my whiskey drinking days the aforementioned (Irish) Bushmills Malt 16 was a favorite, along with Oban. Like edorr below I barely tipple anymore. I have a little dram every few months or so. Thus my bottle of Bushmills will last me until 2050. I might see if there is a sampler bottle of Red Breast that I can purchase. Thanks for the tip. My (very) personal ranking. (Y) means i own them and know them well. Some notes though not good ones frankly. The rankings means that anything with a '0' is the top of the list and all those are ranked relatively equally, and the next category follows. Since there are 4 whiskys in the top category, the next category starts at 5. You get the basic idea. I agree about the Red Breast. Good stuff. I have some Jameson Gold Reserve I picked up in Dublin that's good also. Don't know if I'd be able to afford the Bowmore now bet that's one pricey bottle if you can even find it now. There are so many smaller distillers in both single malt and bourbons that it's hard to keep up but I am trying. I now treat it like cheese; I just go into a specialty store I know and ask for what they like in a certain style. Rarely disappointed and helps me find new makers. LL that's one great list. Wish I would keep track like that. I picked up some Taketsuru 17yr old on a recommendation from a friend. Nice for a Japanese whiskey which I usually don't like. My favorite summer scotch (we have HOT and Humid summers) is Macallan Maker's Mark/Edition Fruit and Spice. Goes very well with a chocolate dessert too.